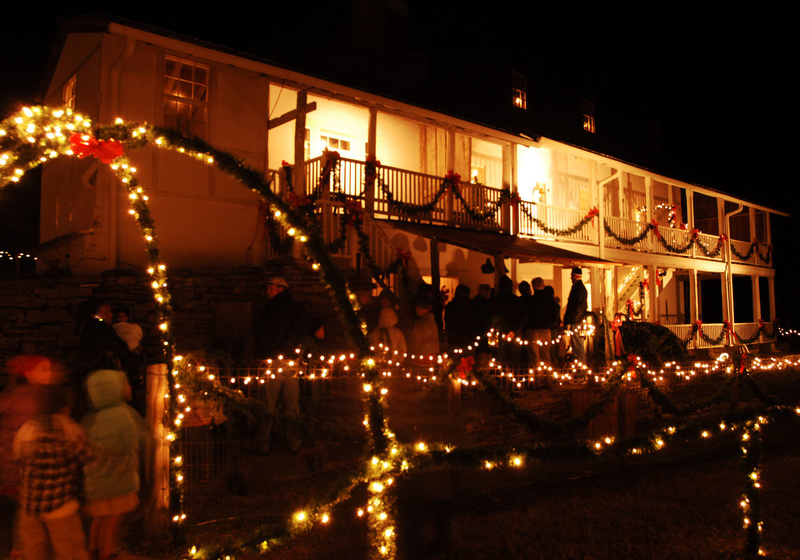 Kriesche Brewery State Historic Site during the Trail of Lights. Thousands of twinkling lights illuminate a quarter mile walking trail at the Monument Hill and Kriesche Brewery State Historic Sites in LaGrange. The trail of lights is open to the public five nights during the first part of December from 6 pm to 8 pm. And our park is decorated with lots of lights and different ornaments throughout the grounds. Kriesche house is open, it’s decorated for Christmas. We have entertainment, refreshments, and Santa Clause is there for children to tell their wishes to. Dennis Smith is park superintendent. The remaining dates are December seventh, eighth, fourteenth and fifteenth. [It’s] just a really pretty site here. We sit on a 200 foot bluff that overlooks the city of La Grange—and see the night lights of the city. It’s just a really spectacular opportunity for people to come out and enjoy a great Christmas celebration. The trail of lights is the perfect family activity for the holiday season. Every year we have comments from families that say we’ve been coming out here for the last 20 years. Families that come from Houston, Austin, San Antonio—just to come back to the trail of lights each year. We see more and more of that as we go by, and are just really glad to see these families keep coming back with more generations of their families to help celebrate the season. Find details about all holiday events at State parks at texasstateparks.org. You are currently browsing the Passport to Texas weblog archives for the day Tuesday, December 4th, 2018.